The view from our room. Photo: Peninsularity Ensues. 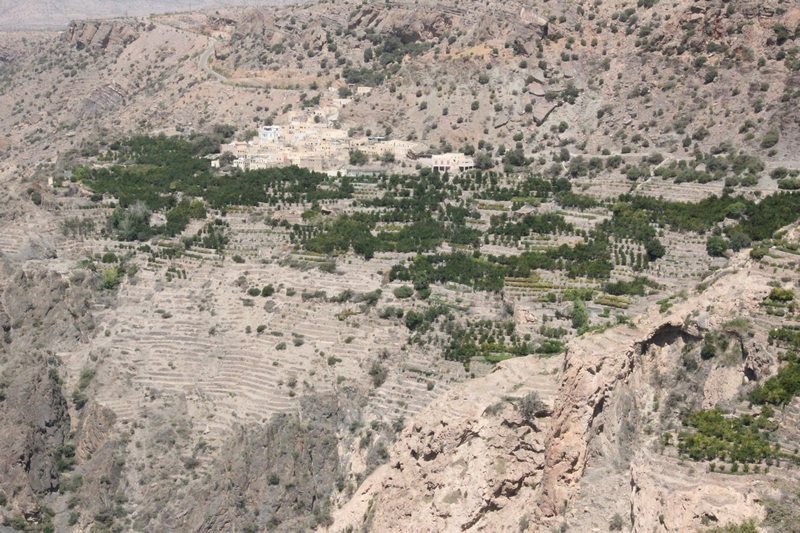 A popular summertime activity in Oman is hiking in the mountains, with its stunning scenery and perfect weather… a welcome respite from Muscat in July, which is the favourite time of nobody, except maybe people who sell and service air-conditioning systems. To beat the heat, my wife and I took a drive up Jebel Akhdar (Green Mountain) for a quick getaway. We stayed at the charming Sahab Hotel, perched on a cliff overlooking the Al Hajar Mountain range, enjoying 3-star luxury at 5-star prices… and a 9-star view. 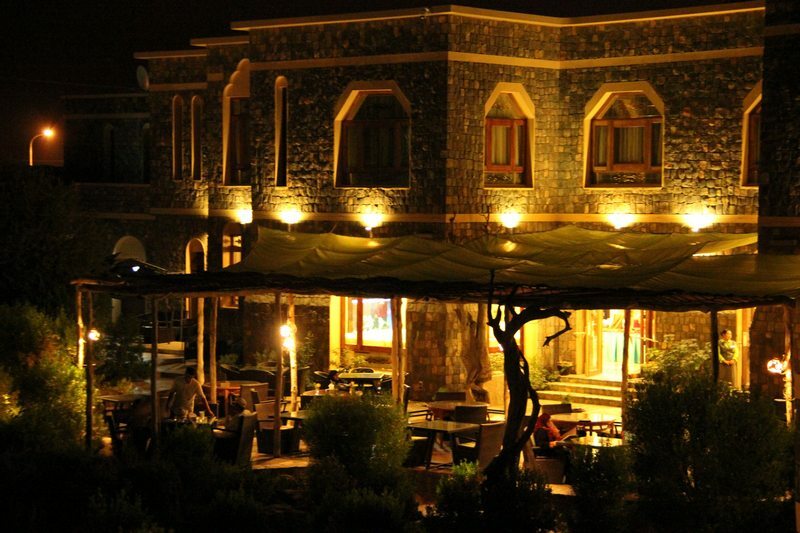 Sahab Hotel, Jebel Akhdar, Oman. If you’re wondering why this place is called ‘Green Mountain’ (because some people do), that’s because if you study each of these photos very carefully, you will notice a small amount of foliage (thus making the mountain a lot greener than most places in Oman). Anyway, we couldn’t wait to begin our rugged hiking adventure… so, in accordance with ancient local custom, we immediately had a few drinks and relaxed by the pool. Pre mountain hiking adventure warm up. The next morning, like all hardened adventurers, we had a nice continental breakfast, another quick swim, then set off down the mountain trail. 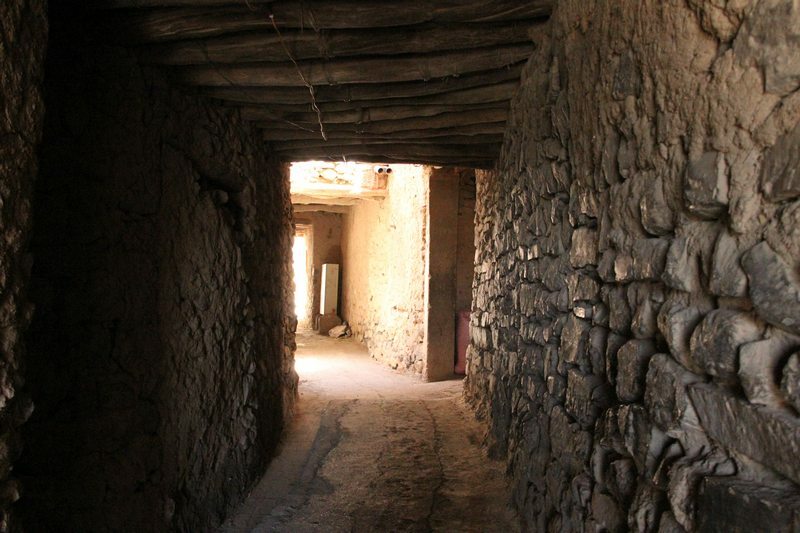 Our first goal was to reach the village of Ash Sharayjah, about two hours away. The target… that ancient village over yonder. 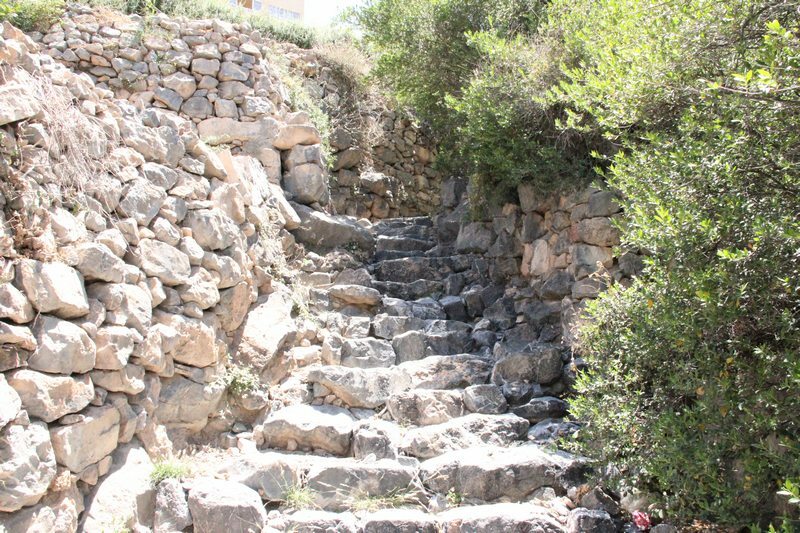 The trail led us through tiny pre-Islamic villages, down well-worn paths, along no paths at all, past wadis and farmers who waved at us from their amazing tiered terraces carved painstakingly into the rock, hundreds or maybe thousands of years ago. …hoping we’re not terribly lost. We wandered along, chatting about the tranquil wonder of this beautiful and remote place… and as if on cue a guy walking in the opposite direction casually said, ‘Hey, I know you’. The last time I’d bumped into my old South African friend and colleague Unio was on the Seoul metro in 2008. As travelers working in a transitory industry, this chance encounter was only surprising for the fact that the three of us weren’t more than mildly surprised to see each other again here on an Arabian mountain trail. We chatted for a few minutes, swapped phone numbers and carried on. You bump into old friends in the most unlikely places… or, somewhere else. These guys wanted a photo. One of these very relaxed looking guys, taking note of my heavy breathing kindly suggested that I could possibly benefit from more exercise. I thanked him for his sage council. Ten minutes later, we bumped into them again as they were climbing into their 4WDs to depart the village, presumably in the same manner they’d entered it. What we had attained however was the sweaty satisfaction of having traversed the mountainside by foot to reach this place, and it had been well worthwhile. Also quite satisfying was the hotel’s complimentary pick-up service, and ten minutes later we were back at the pool. 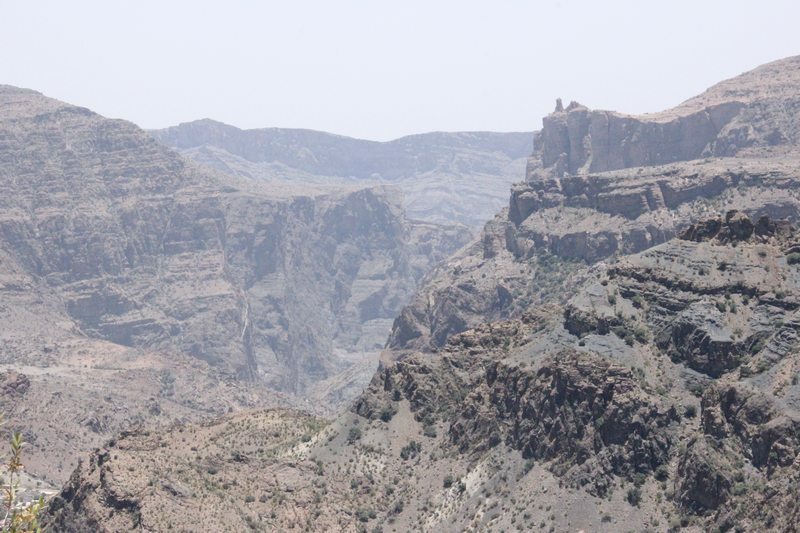 Jebel Akhdar is an easy 2.5 hour drive from Muscat. You’ll need a 4WD to get there, not because of the challenging terrain, but because the police checkpoint at the bottom of the mountain won’t let you up there in a conventional vehicle. Nobody I’ve spoken to knows quite why this is, except for the possibility that many people in this part of the world have limited experience driving on roads that aren’t flat. 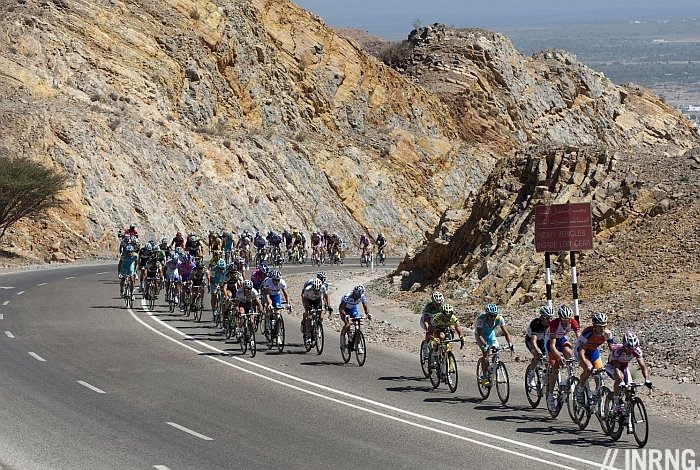 Only 4WDs can traverse this treacherous road… and bicycles. 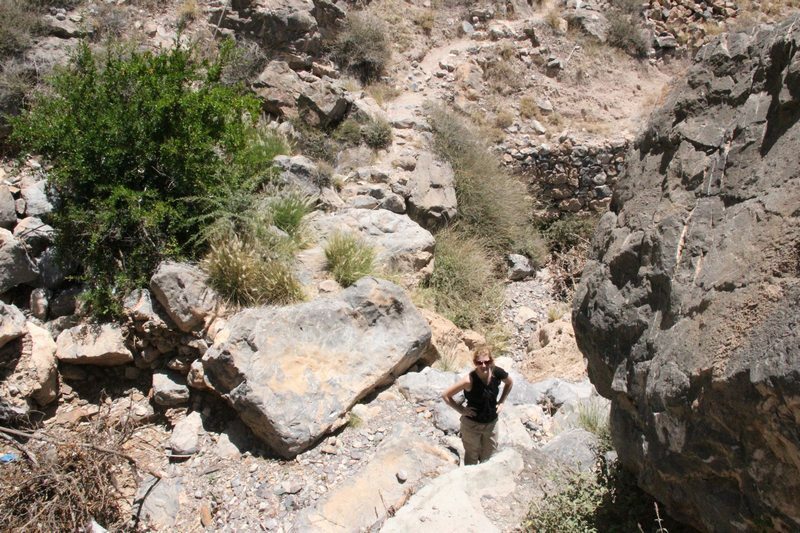 2 Comments on "Mountain Hiking in Oman"
Lucky wife, surrounded with so much sweaty testosterone! A wonderful places to visit and the scenery so fantastic and very romantic!! Aliens from Planet Gootan: Crisis Alert! !